i know it's not good for the mortar, but i love how a building looks when ivy has taken over. Further evidence of the "go green" environmental movement! 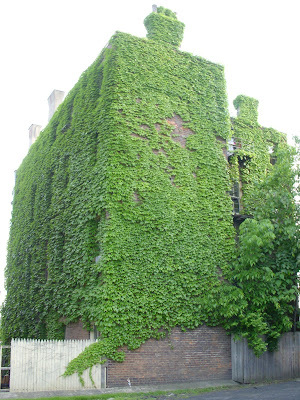 Ivy like this aside from being detrimental to the outside of the building and motar. It also collects water and provides an haven for mosquitoes, and on vacant buildings with open windows can create moisture sources on the inside which can cause mold. Many municipalities, I doubt that Cincinnati does it yet, requires property owners to keep building clear of it. I love the look of it as well ( in a controlled way) but it really not good for a house.